Deliver a big thanks on the little guy's behalf with our baby boy thank you cards. When your little girl wants to show her appreciation, these thank you cards are perfect. 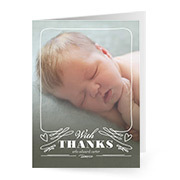 These adorable baby themed thank you cards express your gratitude. You have just brought home your brand new little one and chances are that plenty of people have been there for you along this fun journey. Whether you want to send out thanks for the good wishes, baby shower gifts, thoughtful gestures, babysitting offers and casseroles, or simply show off your new darling baby, custom thank you cards are a great way to do it. Shutterfly makes it easier than ever to turn your first picture memories into adorable, custom baby shower thank you cards. Whether you just brought home your new baby, or you have just celebrated a whole year, chances are your bundle of joy has a distinctive personality. With Shutterfly, you can upload the pictures that best capture your darling and pair them with a stylish template for a thank you card that is as unique as they are. Simply upload some memorable images, choose one of the easy-to-use templates and select your favorite design elements. Custom cards are a great way to share your joy with friends, family and the people you love. Your message can be short and sweet with room to handwrite a personalized message, or you can design cards one at a time for the people who have gone the extra mile for you. For the finishing touch for your custom cards, personalized mailing address labels will seal the envelope. If you have a new baby (especially if it is your first), most likely your phone and camera are both overflowing with digital pictures of your little boy or girl. Shutterfly is here to help you pick your favorites and have them sent to you as beautiful photo prints. These can be handy to show off your little nugget and can be included in your baby thank you card, too. Another unique idea would be to turn your baby's sweet face into a custom sticker set. Shutterfly is your one-stop shop to help share your beloved maternity photos and newborn photos. Turn your favorite photos and memories into beautifully printed stationery sets, gifts or ready-to-display decorations, with the click of a mouse.